SEGA Forever, the SEGA initiative to bring some of their classic library to mobile devices, has had quite the year. It launched in the early summer in a rather dismal state, faced a swift backlash, and has been trying to crawl its way back up ever since. While largely limited to games from SEGA’s 16-bit console thus far, the selection has been eclectic to say the least. I’m not surprised the team wants to close out the calendar year on something of a safe note with the release of Gunstar Heroes (Free), a game that has quietly become one of the most popular classics in SEGA’s back catalog. It’s one of the more frequent re-releases from that era, and even iOS has played host to a version before. Assuming you’re already familiar with this classic run ‘n gun, you’re probably just wondering how this particular version is. 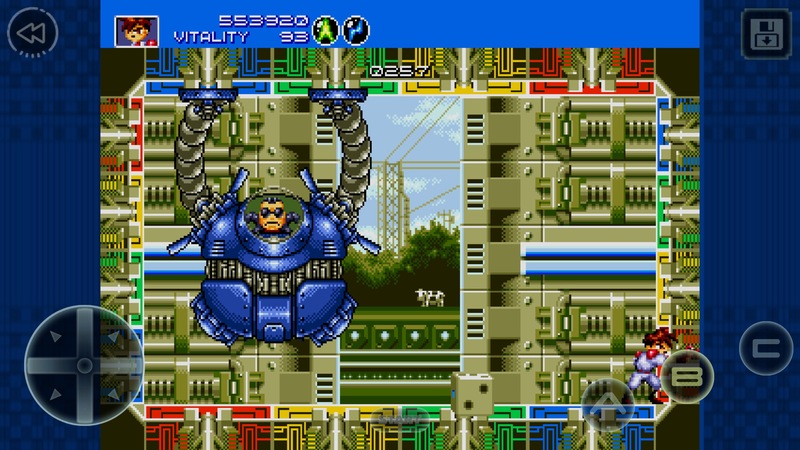 The SEGA Forever Mega Drive emulator has improved considerably since launch, luckily. 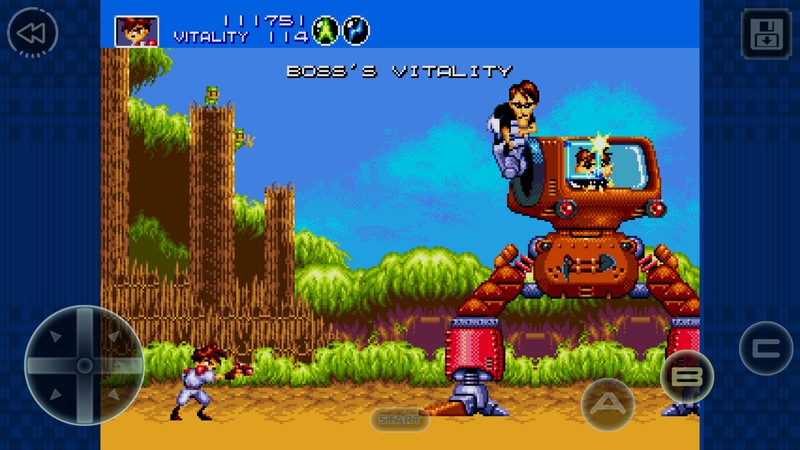 Gunstar Heroes uses a lot of unusual tricks and effects, and they come off well enough here that I doubt anyone will be bothered by the minor inaccuracies. The game includes the usual SEGA Forever bells and whistles such as save states, a 15-second gameplay rewind, customizable virtual controls, and MFi controller support. It also allows for local multiplayer via wi-fi, a critical feature for this game. You can play for free if you don’t mind seeing the occasional ad, or you can pay a one-time IAP to remove non-SEGA ads and activate a couple of special features. If you already bought the game, you can hit the Restore Purchases button and enjoy the benefits of your foresight. The MFi controller support is an important feature in this version. I’m generally pretty good with virtual controls, but if I have any bone to pick with SEGA’s new Mega Drive emulator, it’s with the directional pad. It gets by well enough most of the time, but it’s not great for games that require precision, particularly along the diagonals. 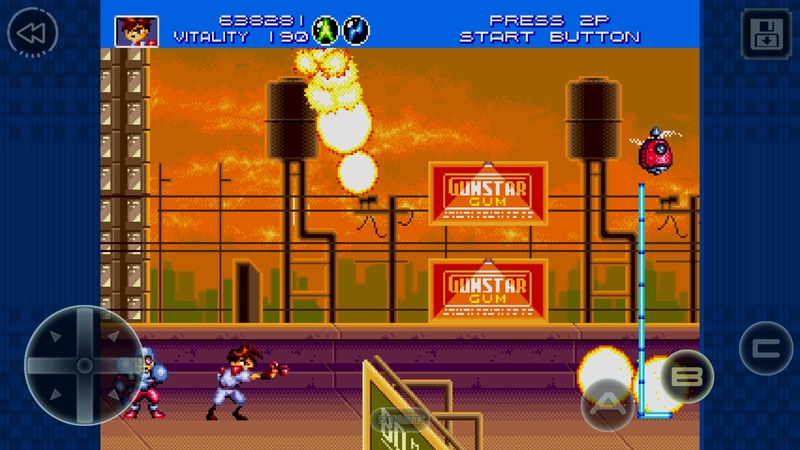 Gunstar Heroes is definitely one of those games, unless you restrict yourself to the so-called “Shachou Laser" weapon that automatically targets anything while you hold down the button. Honestly, there’s only so much a developer can do to address this kind of problem with virtual controls, but there’s a certain stiffness to the SEGA virtual d-pad that makes it feel a little worse than the norm. Another issue that’s familiar by now is how difficult it is to hit two virtual buttons at once, something you’ll need to do in Gunstar Heroes fairly often. Reliably hitting the jump and shoot button at the same time with your thumb can be tricky, especially if you’re using the default button layout. Moving the buttons around helps a little, but I found I had to switch to a two-fingered approach whenever the action got really hot. It’s not exactly ideal for the train, in other words. But you can get through the game with the virtual controls provided you’re willing to put up with the odd occasions where they’re not quite up to the task. It does make a reasonably tough game even harder, and that might be enough to put the kibosh on it for anyone without an MFi controller to fall back on. Gunstar Heroes was the first game developed by Treasure, a team founded by former Konami employees who would go on to develop a loyal following among fans of 2D action games. Though it was their first game as a new company, their previous experience shone through brightly. Gunstar Heroes is one of the best games in Treasure’s library, and is indeed one of the finest side-scrolling run ‘n gun action games ever made, if you ask me. One or two players take on the roles of Gunstar Red and Gunstar Blue as they battle the evil Empire for control of four powerful gems. The game is made up of seven stages, each quite different from the last. You can choose the order in which you tackle the first four, with each successful completion increasing your maximum HP and making the remaining stages a little easier to take on as a result. It’s hard to talk about the game’s highlights as it frankly is one big highlight reel from start to finish. One of the cool things about Gunstar Heroes is its weapon system. You can choose your starting weapon from one of four different types. As you play through the levels, you’ll come across power-ups that allow you to use the other weapons. Now, you can go ahead and use them in their basic forms if you want, but once you’ve picked up a second weapon, you can activate both at once to make a powerful new weapon. You can mix and match for various effects, or use two of the same type for extra kick. As an example, if you collect two Chaser weapons, you’ll get a souped-up group of shots that home in on the enemy. Combine a Chaser with a Lightning and you’ll get a piercing shot that tracks anything on the screens without you even having to aim. You’ll come across weapon power-ups often enough that you should be able to get the kind of weapon you want without too much trouble. It’s fun to experiment even though the weapons are wildly unbalanced. The game’s level designs are another great feature. The sheer variety is unreal for a game of this type. There are a couple of levels where you’re doing the usual left-to-right march of death, but you’ll also spend entire levels riding on zooming mine-cars that can defy gravity or throwing a die around as you blast your way through a tricky dice game. The boss battles are equally imaginative and impressive, often featuring multiple forms with unique attacks. The bosses are usually made up of several sprites, creating towering monstrosities with multiple moving parts. If you’ve ever wondered what kind of wild graphical tricks the Mega Drive could pull off, this is one of the better games to demonstrate. Little of that would matter, however, if the game didn’t feel good to play. This is where Gunstar Heroes truly excels. Your character has a surprisingly large arsenal of moves at his disposal. Sure, he can and will spend most of his electronic life pulling the trigger of one gun or another, but he can also jump, slide, throw, and pull off an aerial melee attack when the situation calls for it. Both Gunstars can grab onto overhead ledges and flip themselves up or down, too. You can choose between a regular or fixed shooting style, allowing you to run while shooting or plant a foot down for easier aiming. Using the fixed shooting style can help with some of the virtual d-pad issues, but the regular style makes for an easier game independent of such concerns. This is a decent port of an outstanding game that really isn’t at its best with touch controls. If you have an MFi controller, you’ll have a great time here. If, however, you prefer to game au naturel on your mobile device, you’re going to have to work through some frustrations that come from a fast-paced action game being squeezed into controls it was never meant for. Even with that in mind, it’s really hard to say no to Gunstar Heroes, but you may want to try it out for free to see how you take to the virtual d-pad before you drop the pocket change for the premium upgrade.